We can not compete with Africas Big 5, elephant, lion, buffalo, leopard and rhino but can put you to trail the five largest mammals of South America. 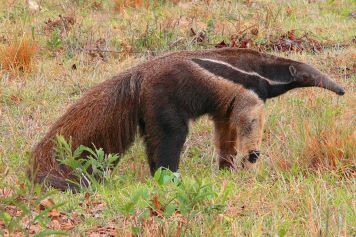 Our photo safari takes you to 3 different regions in Brazil, you will make a fascinating experience to watch our endangered Big 5 in the wild: jaguars, giant otters, tapirs, anteaters and southern right whales on one trip. Also, the capybara would be by size and weight an appropriate candidate for our list of Big 5 These rodents however, are quite common on our tours, so that they are not special anymore. The same applies to the Cayman. Our Big 5 Photo Safari includes the northern Pantanal wetlands, in the Federal State of Mato Grosso, with the airport of Cuiabá, Varzea Grande being the gateway. A jeep ride down the adventurous dirt road Transpantaneira brings us to Porto Jofre, located between the rivers Cuiabá, São Francisco and Piqueri. This is the home not only of the jaguar Felis onca. 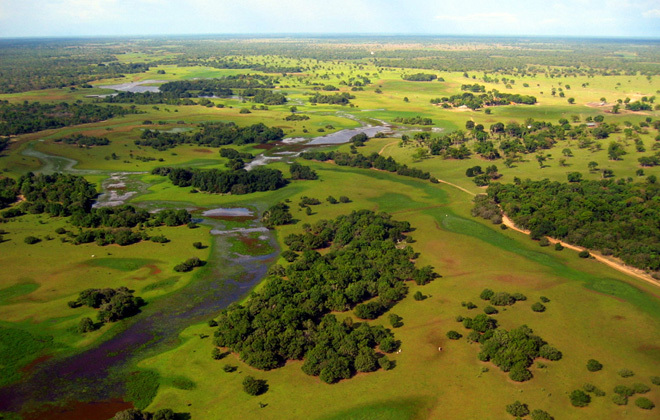 From here we fly to Campo Grande, where a different Pantanal environment called Nhevolândia savanna awaits us offering sights of a great variety of mammals, reptiles and particulary birds. 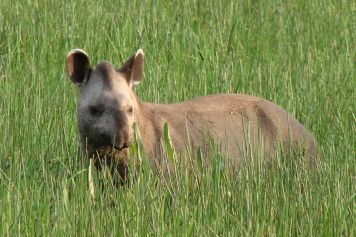 Here, our clients will have a unique opportunity to accompany wildlife conservation projects for the tapir Tapirus terrestris and/or the giant armadillo Priodontes maximois. Our guests particularly appreciate the comfortable rooms at the fazenda, the excellent cuisine und the "open bar", offering free drinks like the famous Brazilian caiprinhas, beers and fine wines from Chile and Argentina. Furthermore we have included the state of Santa Catarina in Southern Brazil where we have set up meetings with the southern right whales during July through October.You will be comfortably staying at one of the most beautiful beaches in Brasil called Praia do Rosa. 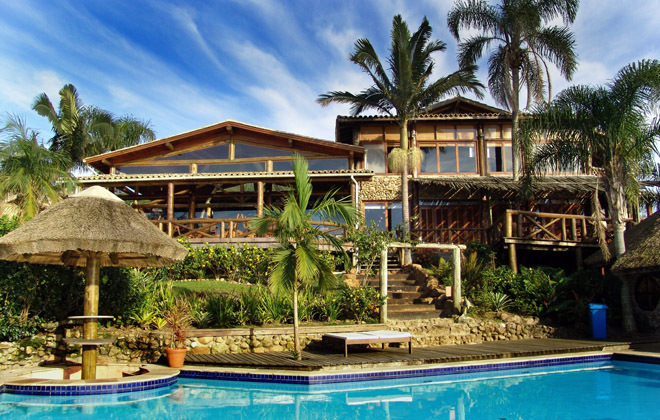 It is located just one hour from Florianopolis airport. The word “jaguar” was given to the cat by the indigenous people of Latin America, who called it “jag war”, which means, freely translated: “the flying hunter”. 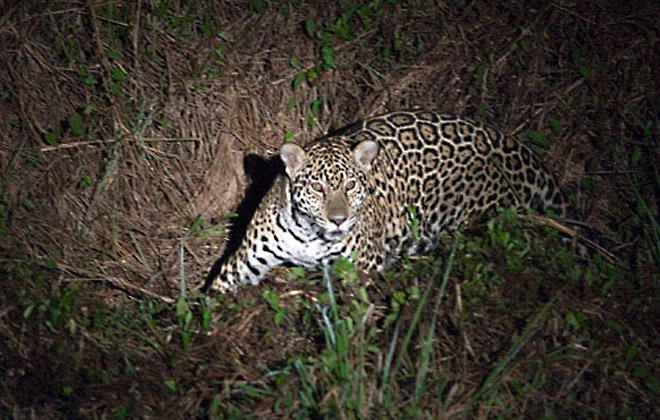 As the presence of the jaguar ranges from Mexico to northern Argentina, there are however other interpretations regarding the origin of its name. One is related to the Tupi-guaraní word yaguareté. The jaguar (Panthera onca) does not reach the size of tigers or lions but is known for the fact that he has the most powerful jaws of all big cats. Named “onça (onssuh) pintada” in Brazil, the jaguar finds in the northern and southern Pantanal ideal conditions and plenty food supply to reach an average weight of 103 kg for a healthy male, but jaguar males of about 150 kg have been caught in the Pantanal, which is about the double of weight of the jaguars in Central America. 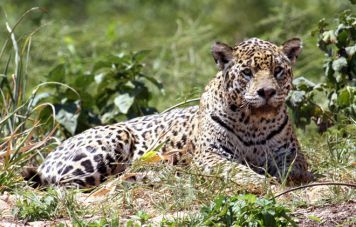 The jaguar is basically, but not exclusively, a nocturnal rogue, a stalk-and-ambush predator and prefers water near habitats, particularly gallery forest. Declared as near threatened by the International Union for Conservation of Nature and Natural Resources and included in the Convention on Intertnational Trade in Endangered Species CITES, apendix 1, the species enjoys an increase of long term survival in about 70% of its range, particularly in Brazil. Jaguars love to relax on the riverbanks in the shadow of bushes and trees of seasonally flooded wetlands, like the Pantanal. Since the animal covers great distances up to 30 km on his nightly stalks, its observation during the day requires patience on long searches aboard our fast and keelless aluminum boats. 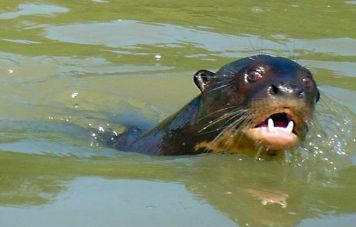 The giant river otter (Pteronura brasiliensis) lives in tens that he burrows into the banks of quiet and smaller tributary rivers. He is a nomad by necessity. Depending on the water level and food supply in the area he is forced however to moves frequently to other areas of the river or even to other rivers. During a certain period of the year when the water levels in the seasonally flooded wetlands are steady and the food supply remains generous, the giant otter remains in the area until the supply thins out. These are the ideal spots to observe these amazing animals. Jaguar and giant otter live in the same region. The search for the jaguar and the giant otter therefore is done simultaneously by boat. Giant otters have been hunted extensively as they fish in large families and therefore reduce the fish population in the area significantly. The species is still much more endangered as the jaguar. It is believed that only a few thousands are surviving in the wild, mainly in Peru and Brazil. Among the threads are destruction of habitat, water pollution and poaching. 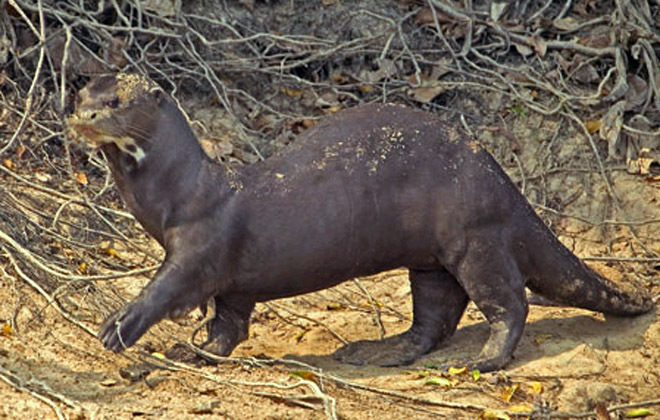 The giant otter is a huge animal of the weasel family. Its length of up to 1.8 m made him the giant among the otters. They have long flexing bodies and powerful tails which they use as rudder and to propel when they swim. They also have webbed feet, water-repellent inner fur with some 70,000 hairs per cm² to keep them dry and warm, and nostrils and ears that close in the water. The giant otter lives in a highly developed social system, living and hunting in families of up to 10 members, with a prey spectrum much more limited than that of other otters. Excellent swimmers and divers they can stay several minutes under water. Their diet comprehends mostly of fish added by crustaceans, frogs, and snakes, which they hunt during the day. A litter of 1 to 6 young is delivered by the female in their underground tens. This relatively high number is needed because of natural enemies like caiman and jaguar. After ten month the young have reached the size of the adult animals. The life expectancy of a giant otter is 10 years. 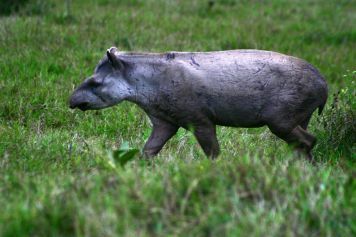 The tapir is the largest mammal of the Brazilian mainland. Muscular and heavy weight, he easily reached 200 kg and 300 kg in some cases! The short, stocky legs have front 3 and rear 4 toes. Therefore, there are odd-toed ungulates. A characteristic feature is the long nose that ends in a mobile and sensitive snout stump. The oval-shaped ears resemble those of horses and rhinos, which also belong to the species of Perissodactyla family Tapirideae. They have poor eyesight but have a highly developed sense of olfaction and hearing. Often called “gardeners of the forest”, their habitat is the dense jungle, near rivers, lakes or swamps. They are excellent swimmers and can, especially if they are being chased or threatened, remain under water for a long time. They are generally nocturnal, but may, where they do not feel threatened, be easily watched also during the day and twilight hours. Although the animals are very peaceful, they can show an aggressive behavior when they are harassed. Then they rush off in a wild gallop and run down everything in their path. As for the diet, the tapir appreciates a variety of leaves, roots and fruits. In the mating season the male utters whistles to attract females of interest. The gestation period is usually 14 months, after which only 1 young is born. After about 6 months the pups reach maturity and are from that time on their own. The tapir is one of the last of the so-called megafauna family who emigrated at the end of the Pleistocene age from the northern to the southern hemisphere. The tapir can be found in 11 countries in South America, as well as in Central America and some Asian countries. Although relatively common in Brazil, the species is not protected from extinction. The total population is currently decreasing, because of reduction of habitat and also hunting contribute significantly. 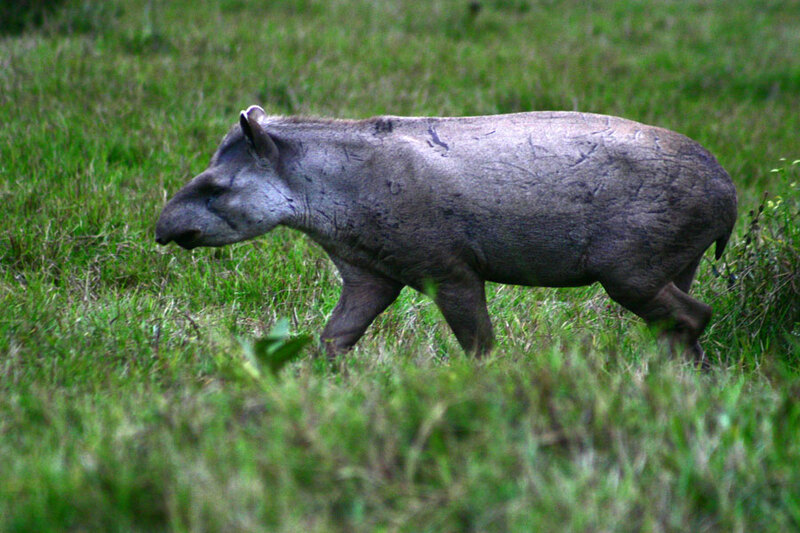 In the Amazon region is the tapir, the preferred prey for hunters. In the Peruvian Amazon region of Loreto are annually killed between 15447-17886 animals. 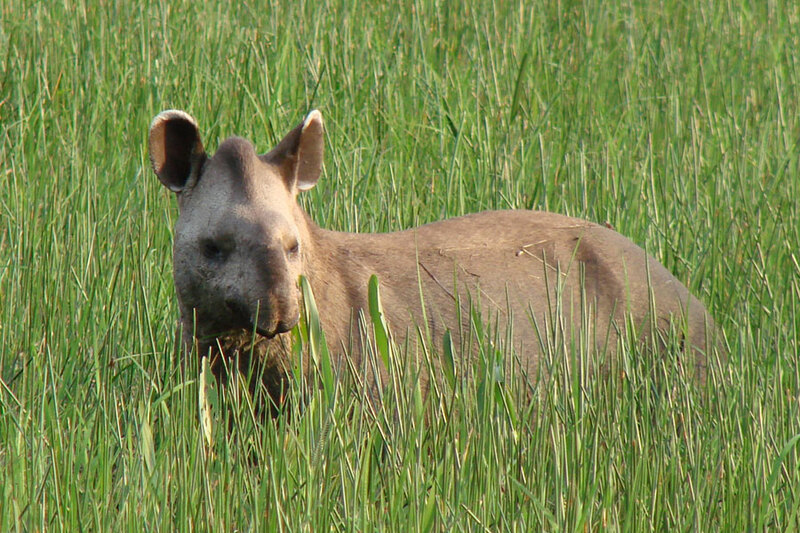 In Brazil the situation is not quite as threatening, even though the IUCN (International Union for Conservation of Nature) lists the tapir as endangered. To give you the opportunity to observe this fascinating and "sensitive steamroller" in the wild, the tapir was added to our list of the "Big 5". 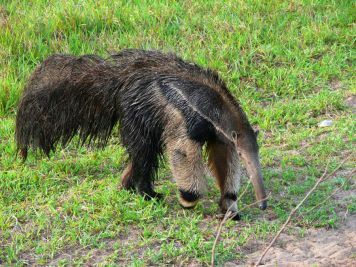 From the family of poor dental mammals, the giant anteater (Myrmecophaga tridactyla) it is the only one who has no teeth at all. The special feature is the long, thin snout and a long tongue for feeding. They destroy with their large claws, the termite hills and with her long tongue take out around 35,000 ants a day. In Brazil there is also the saying of the “deadly embrace” of the giant anteater. A story we will tell you once you are on trail with us. 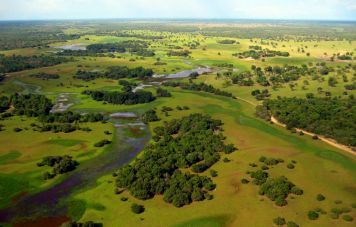 The crepuscular and nocturnal animals are solitary and live in savannas. Often they can also be seen during the day in the grasslands. They are threatened only by their natural enemies which are Jaguar and Puma. But, occasionally they are also victims of dogs, fires, and even of traffic accidents. A high population decline has been observed in recent years due to the low birth rate of only 1 young after 190 days of gestation. 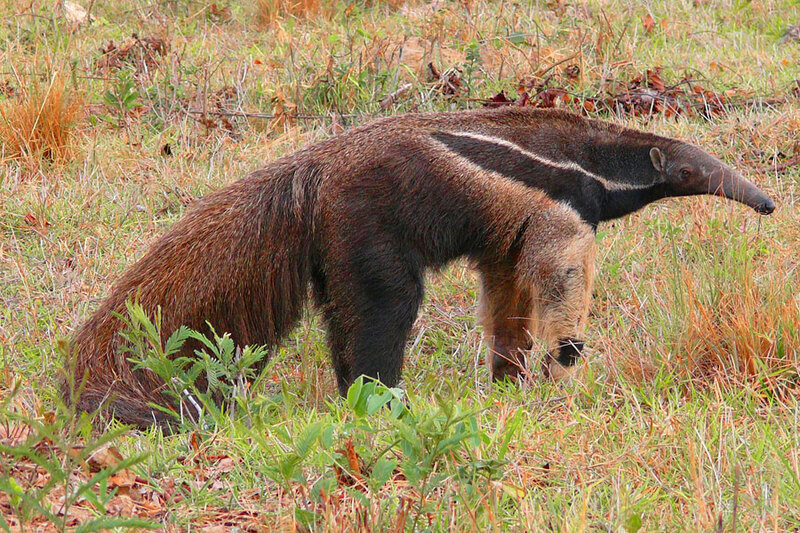 Therefore, the IUCN has listed the Great Anteater, like the tapir as endangered. Where the giant anteater can be seen, the lesser anteater is not far away. Both are, in appearance like in behavior, unusual and exotic animals. 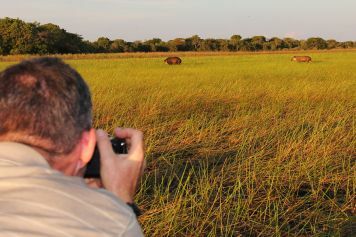 That is why they were worthy to be there in the list for our photo safari of the recorded "Big 5". On the ninth day we take a late flight from Cuiabá to Florianópolis, the capital of the Santa Catarina state, arriving there around midnight. Overnight. Next morning1½ hr transfer to Praia do Rosa Beach Resort and check-in one of your seafront bungalows. 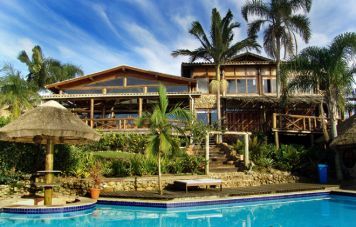 The resort is set on a hill, overlooking the beach and offers first class and deluxe standard in some of the bungalows. While you did not come here for all the comfort and class, you certainly will appreciate it after all these days in the “bush” chasing jaguars and giant otters. You may not know but it is not just Canada, Baja California or Peninsula Valdez which qualifies for superb whale watching. The Club “Les plus belles baies du monde” (www.world-bays.com) included Praia do Rosa beach, in southern Brazil in its list of 28 chosen beaches, because of its natural beauty, conservation awareness and the APA, Environment Protected Area, of the Southern Right Whales (Franca) Eubalaena australis. 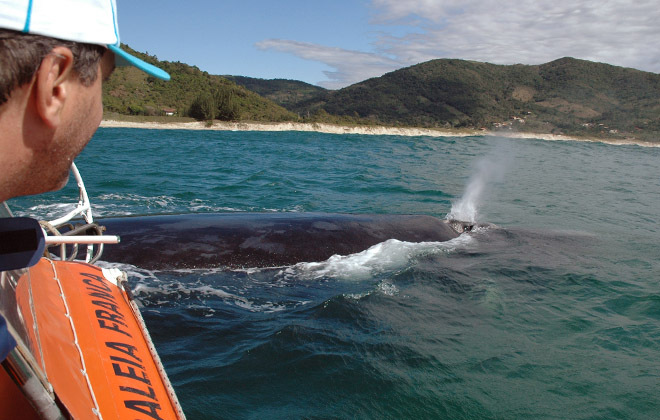 During July-October the well over 40 tons heavy whales arriving here from the southern polar regions, hence their name, to give birth and to rise their off-spring in the protected waters of the Santa Catarina coastline. When the last SRW was killed in 1973 at Imbituba whale station the species was nearly extinct. 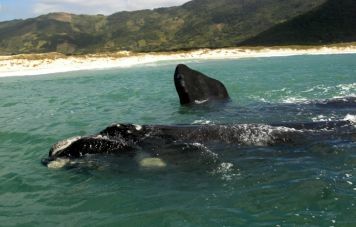 Brazil, being signatory of the Whale Protection Act, has managed to increase again the population of both SWR and hunchback whales. This package consist of an unusual combination of 5 days of whale watching and other activities. 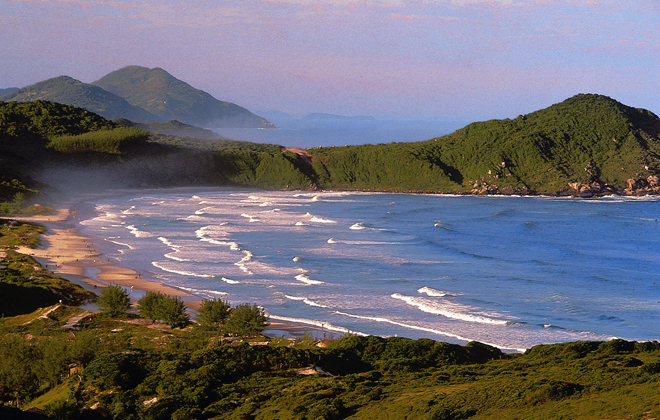 The Praia do Rosa and other nearby beaches are among the finest in Brazil and offer also pleasant beach riding, surfing and kite surfing. A side trip to the historic village of Laguna is included. Among other historic events in the earlier times of the colonization, the Italian freedom fighter Guiseppe Garibaldi, married to Anita Garibaldi, lived and fought here. The house where they lived together is open for visitation. Laguna also features one of the rarest spectacles on earth: The mullet fishing with the "assistance" of dolphins. The itinerary starts with an introduction given by the Institute of the Franca whales, (IBF) at the resorts facilities, with an interesting history regarding origin of the species, behavior, reproduction and presence in the region. Daily outings in state of the art rubber rafts will bring you face to face at hand shake distance with the whales. Occasionally you will be able to watch and photograph those giants of the seas right from the beach. On day 14th, after having met with Brazils "Big Five", you will be transfer back to Florianopolis airport for your journey back home or for one of our extensions. Please note that qualified wildlife guides and accomodations are limited. We therefore highly recommend to make sure that bookings are being placed at least 6 or even 8 month prior travel date.